The Retrosheet site can tell you the league averages for various situations going back to 1952 for the NL and 1953 for the AL (plus some earlier years). Here I show the league differences in close and late (CL) situations for both batting average and isolated power. Each league is done separately and each data point is a 3 year average (just a simple average, with the exception being that the first AL data point is just 1953-4). 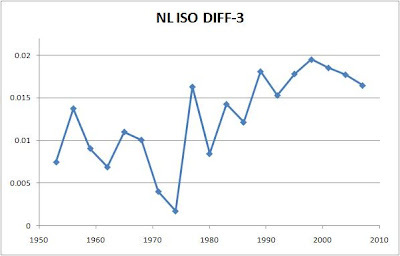 The first graph shows the NL AVG difference. That was calculated by the non-CL situations minus the CL situations. 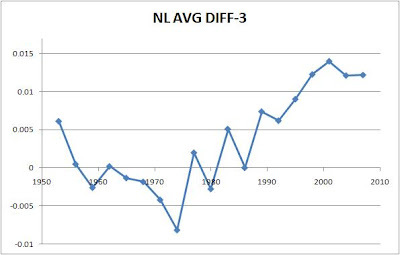 For example, in the NL in 1952, the non-CL AVG was .251 while the CL AVG was .248, for a difference of about .003. The next two years had differences of about 0.007 and 0.008, respectively. So the first NL data point was (.003 + .007 +.008)/3 or .006. Notice how the difference is growing over time. This might be due to the greater specialization of relief pitching. 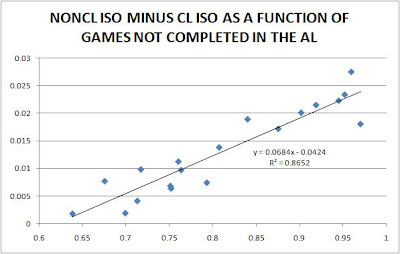 But that is just a guess (although the correlation between the 3 year AVG difference and the % of games not completed is .74 in the NL-it was also about .74 for ISO-in the AL those correlations were .85 & .93, respectively-the last graph shows NONCL ISO MINUS CL ISO AS A FUNCTION OF GAMES NOT COMPLETED IN THE AL). Now the same graph but for isolated power (or SLG - AVG). I wish I could explain what was going on in the late 1960s and early 1970s. It does not seem like it was that much harder to hit in CL situations than non-CL situations in the NL. Now the AL graphs. The graph below shows how closely related the difference between clutch and non-clutch hitting is to the % of games not completed. The fewer games completed (the more relievers are used), the harder it is for hitters to keep up their normal power hitting in close and late games. He does well (actually 16 of these guys had at least 4000 PAs and no one was under 2700). Of course, it his Tenace's prime years, so it is slightly biased in his favor. But he still looks good. Of the 10 guys ahead of him, 6 are in the Hall of Fame. And I see that he is ahead of 3 Hall of Famers shown here (and a few more ranked lower), who were generally going through the quality part of their careers. If not, they were certainly not in any kind of decline phase. He did not qualify for the league lead in 1980 with just 416 PAs. But his OWP was .650 that year. 1974 was the only year in this period he was under .650. Bill James says that 20 Win Shares in a season constitutes an all-star type year. Tenace had at least 22 every year from 1973-79. In 1975, he had 32, tied for 4th place, 1 behind MVP Fred Lynn and John Mayberry and Ken Singleton. He averaged 24.7 WS per season over those 7 years. His 198 WS for the 1970s was the 31st highest total, including pitchers. He ranks 177th in Wins Above Replacement level at Sean Smith's Top 500 site. Of course, he had under 500 PAs after the age of 33, so his percentages don't suffer much from a decline phase. But still, he did rank pretty high on my OWP above .600 list, where no one is hurt by a decline phase. "The Mariners have allowed 63 unearned runs this year. The league average is 50. That predicts them to score about 4.11 per game while it is actually 3.95. Over 148 games, it amounts to 24 runs below expectations. So now we have already accounted for 37 of their -53 run differential (584-637). That says they should allow 4.266 per game and it is really 4.304. Over the 148 games it adds up to 5.59 runs. So now we are up to explaining over 42 of the -53 runs in their differential (which should be very close to zero given their stats I mentioned above). So I think they have been a little unlucky hitting wise, scoring 24 fewer runs than expected. Then they are allowing too many unearned runs. Also, if I applied the hitting formual to their pitching stats, it would mean they have given up 26 more runs than expected. That could be bad luck or a weak bullpen. My guess is that they know about all this." Below are two messages I just posted to SABR-L. It looks like Berra's extra good performance in close and late situations is significant. I also found that there is a bigger gap now in how players hit in close and late situations versus overall than there was in Berra's time. On Septemeber 16, 1955, the Yankees beat the Red Sox 3-2. They came from behind with 2 solo HRs in the bottom of the 9th (by Bauer and Berra). That info is, of course, from Retrosheet. The win put the Yankees in a tie for first place with the Indians. It was the first day in Sept that the Yankees had at least a share of the lead. The Yankees had 9 more games and never fell out first place after this. Click here to Retrosheet's box score and play by play. And click here to see Baseball Reference's report on the game. Berra's HR was an inside the park job. According to Baseball Reference, it was his only inside the park HR in his career (BR lists just 1). There must have been something going on that day, since Robin Yount was born. Click here to see Baseball Reference's breakdown of his HRs. Anyway, it looks like a clutch hit for Berra. I came across this game looking for something else. So I checked Retrosheet's splits since Berra has a reputation for having been a clutch hitter. It turns out that for the years that Retrosheet has the data posted, 1953-1965, Berra batted .304 in close and late (CL) situations. Using the none on/runners on data that Retrosheet lists, I found that Berra had an overall average .277 from 1953-62 (Retrosheet says "some situational stats are missing due to lack of play-by-play data for some games"). The combined AB total from the none on/runners data is a little less than his actual total, but it is close). I then found that Berra batted .272 in non-CL situations. So he batted 32 points higher in the "clutch" than he normally did. That seems like a lot and I wondered if it was significant. To see, I used the formula for a Z-score that Pete Palmer used in his “Clutch Hitting One More Time,” article (from By the Numbers, March 1990). It not only takes into account how much different a player hits in a give situation, but factors in the normal or league average difference. 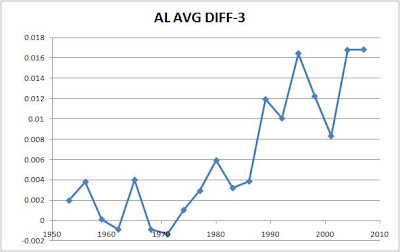 I actually did not calculate the non-CL average in the AL from 1953-62 (it could be done with Retrosheet data). 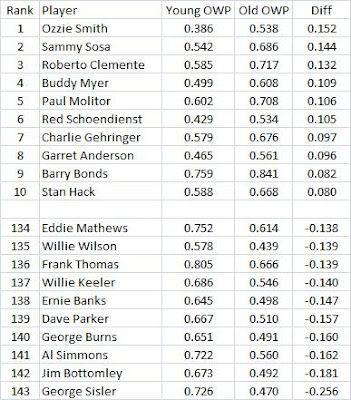 But here are the overall AL batting averages from 1953-62 followed by the CL average (note, this means right here I have not separated out CL and nonCL). It looks like the overall AVG is just a little more than 1 point better. So the difference between the AL CL AVG and the AL nonCL AVG for these years is probably about 2 points or .002. I then came up with a Z-score for Berra of about 1.90. I think that is borderline significant (there must be people on the list who know more about the binomial distribution who could say if that is right). But Berra had a .551 SLG in CL situations while it was about .475 overall. So that is about a .075 differential. Over this time, in the AL, the overall SLG was about .005 better than the CL SLG. So that gives Berra a swing of 80 points. My guess is that is significant, although SLG cannot be fit into the binomial model since it is not an either or event. But Berra's CL HR% was 6.6% while it was 4.8% overall. It looks like his NONCL HR% was about 4.5%. So Berra raised his HR frequency by nearly 50% in CL situations. Now given that SLG was almost the same in overall situations and CL situations during these years in the AL, I assumed no league differential in doing the Z-score for HR%. I got a Z-score of 2.25. That is statistically significant. Of course, a small % of players will, by random chance, have a Z-score this high. If you have more than 5% of the players be plus or minus 1.96 in Z, we don't know for sure which ones got there by luck and which ones were the true clutch hitters (as Willie Runquist would say). But we can see that there was at least some reason why people saw him as clutch. Almost a 10 point difference per year. From 1991-2000, using both leagues, it was .266/.256. My guess is that over time relief pitching cause the differential to rise. 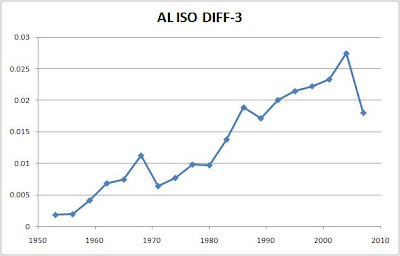 I also mentioned that from 1953-62, the overall AL SLG was about 5 points higher than the CL SLG. From 1991-2000, using both leagues, it was .416/.388, a difference of 28 points. So, just like AVG, the differential has risen. When I get some time, I will chart out all the years that Retrosheet has to see how these differences have grown or changed. But I won't mind if someone else does it. "You were known as a great clutch hitter. Somebody once said that the toughest hitter in baseball in the last three innings was Yogi Berra. What made you so good under pressure? Yogi Berra: I don't know. Maybe I was just lucky. I loved to hit with men on base. Dickey used to holler at me, "You're wasting time at bat with nobody on base," he says." The Retrosheet page of Yogi Berra's splits shows that he also hit very well with runners on base and with runners in scoring position. His average was about 30 points better than at other times. Why Did Al Simmons Decline So Much In The Second Half Of His Career? This is a follow up to my last post on "how good was he?" which you can read below. He batted .363 from ages 22-29 but only .309 from ages 30-37. That is a very big dropoff. I wonder if he had nagging injuries that eventually caught up to him (he missed about 140 games from ages 25-29). There are a couple of reasons mentioned below from his SABR bio. To see how his declined compared to others, I found every player who had 4000+ PAs from ages 22-29 (390 players) using the Lee Sinins Complete Baseball Encyclopedia and every who had at least 3230 PAs from ages 30-37 (also 390 players). Then I found all the players who were in both groups (143) and the difference between their "young" average and their "old" average and ranked them from highest to lowest. The top and bottom tens are in the table below. As you can see, Simmons is very near the bottom. He did not have the biggest decline, but it was still very big. As for Keeler and Davis, those two guys both had their careers cover both a high average period and a low average period. When Davis was 22-29, the NL league average was .287 (Keeler's ages 22-29 are almost identical to these years). Then from 1902-08, when Davis was 31-37, the AL league average was .250 (Davis switched leagues). Keeler spent most of his 30s in the AL, too. From 1903-09, when he was 31-37, the AL league average was .246. But the AL league average when Simmons was "young" was .293 and when he was "old" it only fell to .288. So his dropoff is more surprising. I also calculated the average park factor for the parks he played in when he was "old" and it came out to about 101, meaning average. There might be some lefty/righty issues in those parks, though, that I don't know about it. But it looks like his decline cannot be explained by a changing league average or tougher parks. The A's park had a park factor just under 104 when Simmons was aged 22-29. The simple average of the change in average from "young" to "old" was about .007 (if I only used "old" guys who had 4000+ PAs,it was .006). So if Simmons could have had an average drop off, it would mean that he would have hit aroung .356 in the second half of his career. That would put his career average close to .360, still second to Cobb (I have not quite split his career evenly in two, so I could have overestimated this by a couple of points). Anyway, Rogers Hornsby is 2nd with a .358 average. Simmons is currently 21st all-time in average for players with 5000+ PAs. I wonder if he had made it to 3000 hits if he would be better known today (he would have made it with the higher projected average). Also, he batted .390 or better twice. He was at .401 on July 17, 1927. He played only 5 more games in July and then did not play again until Sept. 6. Maybe some injury cost him .400. In 1931, when he batted .390, he only played 27 games in the final two months of the season. Yet he batted .465 & .426, in those two months, respectively. His combined average then was .442. Another 100 or so ABs at that rate would have gotten him to .400. A .400 season might have made him more famous. Maybe playing for the Yankees would have helped (although being a right handed batter would have hurt). Data in this paragraph came from Retrosheet. His bio by Fred Stein at the SABR Baseball Biography Project suggests a couple of reasons for his decline, but I don't think it explains enough. The bios says "In 1926 Simmons “slipped” to .341 and 199 hits. He was hampered by injuries the following two seasons although he hit for high averages." In 1930, at one point, he had a "swelling knee." He missed 16 games that year. Also, "Years later, Simmons admitted to a writer that he had accepted the White Sox’ second-division attitude and had slacked off in his customary strenuous practice habits." (but he actually did better in OWP, discussed below, in his first two years with the White Sox, .617 & .675, than in his last year with the A's, .590). One curious thing it reports is that Simmons said "I’ve studied movies of myself batting." I wonder how many players did that back then? The table below shows how Simmons declined in offensive winning percentage (OWP) when he got "old." OWP is the Bill James stat that says what your team's winning percentage would be with 9 identical hitters when you give up an average number of runs. In this case, it is park adjusted. As you can see, his dropoff was great. I think Sisler had some kind of eye problem and even missed a whole season. I don't know anything about Bottomley. Maybe sports medicine was not very good back then. Simmons finished with a career OWP of .644, which is now ranked 117th among players with 5000+ PAs. The typical dropoff when getting "old" was about .024. If Simmons had a .698 OWP when he was "old" that would give him a career OWP of about .710. That would currently rank 35th, a big improvement over 117. How Good Was Al Simmons? You may have heard that Ichiro Suzuki recently became the second fastest player to reach 2000 hits. He did it in 1402 games. Al Simmons was fastest, doing it in 1390 games. The answer to the question is that he was very, very good. Great would work, too. Simmons got his 2000th hit early in the 1934 season. His first season was 1924. Through the 1931 season, he was second only to Ty Cobb in lifetime batting average at .363 for players with 4500+ PAs (I used the Lee Sinins Complete Baseball Encyclopedia). He finished his career at .334. That may be a normal dropoff. I really don't know, but it seems like alot. Maybe injuries caught up with him. He missed 143 games between 1927 and 1931 (might actually be a little less than that since the A's did not play 154 games in all of those years). 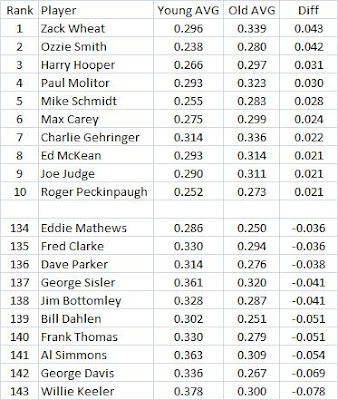 Through 1931, he was also third in isolated power (SLG - AVG) with .233, trailing only Ruth (.360) and Gehrig (.300). He is one of 22 players to have at least 3 seasons with an .800+ offensive winning percentage (the Bill James stat that says what your team's winning percentage would be with 9 identical hitters when you give up an average number of runs). Ruth had 12, Cobb 11, and Ted Williams 10. So he is not close to them, but to be in that small a group is pretty good. He had 375 Win Shares (the Bill James stat that includes all phases of the game). That was tied for 63rd through 2001 (including pitchers). Bill James ranked him as the 7th best leftfielder of all time and gave him an A as a fielder. He played 1377 games in LF and 771 in CF. He was 88th among position players in WS per PA. He led the league in Win Shares once (thanks to Ruth's 1925 stomach ache). But he had 5 other seasons in the top 10, including 3 in the top 3 (once losing to Foxx by a hair in 1929). He led all AL outfielders in fielding Win Shares twice and was third 3 times. He is ranked 85th among position players in Wins Among Replacement at Sean Smith's site. Looks like he was one of the greatest players ever. Good to see him get mentioned in the news. I just searched his name through google news. Got 653 hits. But if I put in "-ichiro" it drops to 40 and some of those deal with other guys with the same name. But I did also learn that he "holds the major-league record with 11 straight 100-RBI seasons at the start of a career" from a Jeremy Sandler article. Geez, I almost forgot. He was of Polish ancestry: his birth name was Alois Szymanski. Click here to go to his Baseball Reference page. Is Chase Utley Undervalued By The Media? "Maybe the media simply has no idea how valuable Chase Utley is,..." said Tom Tango at his The Book blog. If so, I think it might have something to do with Utley being a 2B man. I looked at how many MVP awards have gone to each position as well as MVP award shares. 2B men have done very poorly. Go to MVP Awards And Award Shares By Position to see that study. And it is the media (the writers) who vote. 1B men have won 26 awards while 2B men have won only 10. The discrepancy is even bigger for award shares. Are 2B men really not that good? I don't think so. I counted about 11 2Bmen in the top 100 at Sean Smith's list of the best all-time players by wins above replacement value. And there were some other guys who played part of their careers at 2B. I also did a study called Have Second Basemen Been Underpaid? It certainly is not conclusive, but it is suggestive. Maybe there is just a general mis-perception of how valuable 2B men are and that it is not limited to the media. Is Prince Fielder Good At Hitting "Late" HRs? David Pinto of "Baseball Musings" said "Fielder doesn’t hit many homers late, as only 10 of his 37 have come from the 7th inning on." See Special Day for Fielder. Here are the comments I left on that. I am not sure I agree with what you are saying about Fielder not hitting many late HRs. 10 is 27% of 37 and the last 3 innings are 33% of the game. So it seems like he is pretty close to the proportion we might expect. So it looks like he does not do so well from innings 7-9. But he also has 1 extra inning HR. So his % from the 7th inning on is 6.8%, very close to what he does early. So he looks like he does okay late. One year may not be enough data for a conclusion. If we do 7th inning on, including extra innings, then his career % is 6.96. Have The Phillies Been A Little Lucky This Year? Should They Be Worried? I got thinking about this thanks to a thread at Baseball Think Factory. It had to do with productive outs and how the Phillies were hitting with runners in scoring position (RISP). But the Phillies actually do better with RISP (and in close and late situations) than they normally do. It looks like a lot better. That is usually a case of luck and won't continue into the future. Here is what I posted over at BTF. The Phillies hitters have a team OPS of .792 in close and late situations while their pitchers allow an OPS of .684. So that is a differential of .108. And as mentioned above their RISP differential is .074 while their overall differential is just .023. So they really know how to ramp up their performance when it counts. Yaz had a career average against righties of .299 while it was .244 against lefties (that and all data mentioned here are from Retrosheet). So what do you think was his only season when he had a higher AVG against lefites? Yes, 1967, when he batted .338 against lefties and .323 vs. righties. In 1974 he batted .001 better against righties but every other year in his career saw him hit at least .030 better against righties. In both 1965 and 1966, he batted at least 100 points higher against righties. In 1968 and 1969, it was 46 and 79 points, respectively. So it looks like among all the great things he did that year, he also ramped up his hitting against lefties, even relative to what he did against righties. His OBP was .027 better against righties, but that was the second smallest differential of his career (it .077 for his whole career). The differential was over 100 points in 1965, 1966, 1968, and 1969. His OPS differential was .184, slightly lower than his career differential of .198. But, the differential was .391 & .27 the two years before 1967 and .205 & .332 in the following two years. So at that point in his career, his relative performance vs. lefties may have been unusually good. Plate appearances were just AB + BB + HBP. His differential in 1967 was .0518, his smallest in 5 years and it would not be less than that for another 5 years. It was the 7th lowest of his career. The average differential of the two previous years and the following two years was .0997. Now that is .0479 higher than in 1967. Suppose he did .0997 worse against lefties in 1967 rather than .0518. Over 144 PAs, it would mean 6.9 runs. With 10 runs usually being equal to one win, it is possible that his much better than usual relative performance against lefties tipped the pennant to the Red Sox. Added Point: He also hit especially great after August 31. He batted .417 (40 for 96). He ended August with a .3085 AVG. If he had hit that the rest of the way, he would have had 29.61 hits. So this created an additional 10 hits. He slugged .760 after Aug. 31. Through that date it was .594. This created an additional 16 bases. His OBP after Aug. 31 was .504 while it was .401. A rough estimate is that he had 2 more HRs, 1 more 2B, 3 more singles and about 11.6 fewer outs than expected based on what he had done prior to Sept. 1. Using the linear weights values, that generated about 7.89 more runs than expected. That is almost enough runs to generate 1 more win. But Sept. had the lowest league totals for AVG, OBP and SLG that year (probably not that unusual). YAZ greatly increased his performance while everyone else was going down. So it brings it even closer to one win and that is how many games they won the pennant by. Who Deserved The 1997 NL MVP Award? The reason is that Craig Biggio of the Houston Astros was also deserving of the award (although both he and Piazza were clearly better choices than Walker). The Rockies actually finished 3rd, 7 games behind the West champs (the Giants). The Dodgers were 2nd, 2 GB. The Astros won the Central, but only went 84-78. The Dodgers went 88-74. Sabermetrically, it looks like Biggio and Piazza both had clearly better years than Walker. I do recall that maybe some writers saw that his home/road splits that year were balanced, so they did not discount for Coors. His AVG-OBP-SLG at home were .384-.460-.709 and on the road they were .346-.443-.733. Biggio's AVG-OBP-SLG that year (home and road) were .309-.415-.501 playing in the Astrodome. He stole 47 bases with 10 CS and played 2B. Walker was a RFer. I don't see where Sean lists the year by year leaders, so I will have to leave it at that. Another thing to look at would be the NL leaders in various stats that year at Baseball Reference. Walker does well in adjusted batting runs and adjusted batting wins. I think these are park adjusted. So fielding wins would have to vault either Biggio or Piazza past Walker. Does a balanced offense score more than an imbalanced one? by mgl at The Book blog. There have been earlier attempts to analyze this question. I think the evidence is mixed but various methods have been used. So if simulations, Markov chains, regressions, correlations, standard deviations and covariance are your thing, you'll enjoy all of these posts.